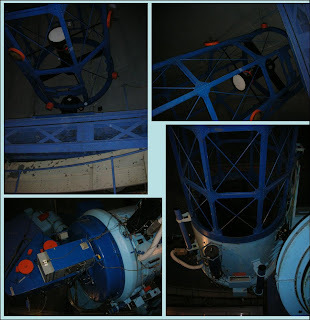 On March 4th 2008, the 433rd Cubs, parents, and a few Scouts paid a visit to the David Dunlap Observatory. Unfortunately the weather did not cooperate and we couldn't actually see the stars or do our work for the Globe at Night's light pollution awareness project. We were fortunate to beat a major snowstorm that descended on the city shortly after we left. We were able to take in a presentation at the administration building that covered many of the requirements of the Astronomers Badge. The tour also counts towards requirement B3 or the Black Star. Our cubs had some good questions and demonstrated their knowledge of astronomy including one or two things that surprised me. 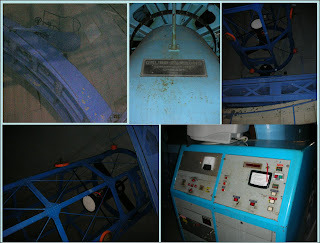 Afterward we were able to visit the observatory dome and see the telescope. The scope is quite massive and the Cubs were impressed that it was so finely balanced that impatient astronomers could move the 25 ton assembly by hand! We learned a bit of the history of the facility, its use for astrophotography, and a renown Canadian astronomer Helen Sawyer Hogg who conducted research at the DDO for many decades. We also saw a spectrographic lens and learned a bit about some of the work being done, including a study of rather bizarre systems known as contact binaries. In these systems two rapidly co-orbiting stars are so close they actually touch but do not merge! There are a number of interesting question that aren't known about these including how they came so close. Hopefully, we will be able to return later this spring to actually look through the eyepiece! Our thanks to Tuba Koktay, Ian Shelton, and Thomas Karmo at the DDO. Posted by Mang (433rd) at 6:39 p.m.
Tuba had brought your blog to my attention. It is a funny coincedence but I was also a scout once and I participated on a tour of the DDO. That event had such an impact on me that it sparked my own interest in astronomy and ever since I have held the DDO in high regard. So much so, that when I heard that the DDO was in danger of being torn down and made into another strip mall I started www.SavetheDDO.org. It makes me unbelieveably angry to think that children will no longer be able to experience the wonder of the universe first hand like I did when I was a scout and like your troop did the other day. March 12, 2008 at 1:07 p.m.